I cannot quite imagine why Tarlaqueños, even people from neighboring towns, would not want to get married in Tarlac. If you have witnessed the wedding setups and displays in Kasalang Tarlaqueño wedding fair last June 22-23, you will agree with me. Let's start with the wedding venue. 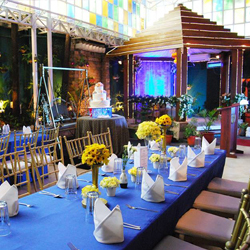 The Aquino Center, where the wedding fair was held, offers a very elegant venue option especially for grand wedding celebrations - high ceiling, state-of-the-art lighting and ventilation, marbled floors and glass halls. A short, romantic walk at the back of the Center will lead you to Microtel Inn & Suites, Luisita, where you, your family, and wedding guests from out-of-town can check in. If you prefer a garden-resort wedding setting, then Coco Gardens of Coconut Grill Resort, one of the fair's exhibitors, is the perfect venue for you. 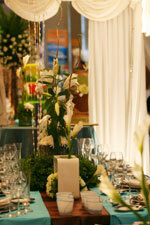 Its lush foliage and lagoon offers a natural tropical backdrop to your wedding occasion. It also has a back up tent and function rooms that you can use in case of rain. During the fair, a photo exhibit of popular Tarlac Churches were also displayed. Among them is the Church of the Risen Christ in Brgy. Lubigan, San Jose, Tarlac which houses the authentic, sacred relic of the True Cross upon which Jesus Christ was crucified and died. If we talk about food and catering, Tarlac is the melting pot of the culinary skills of Ilocanos, Pampangos, Tagalogs and Pangasinenses. 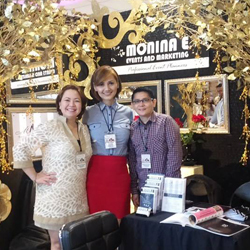 And during the 2-day fair, local restaurants and caterers, gave event guests a sampling of their wedding menu. Florists, event stylists, and fashion designer participants, on the other hand, displayed their unique interpretation of different wedding motifs. The special fashion show on the second day showcased different wedding themes - Victorian, Filipiniana, Oriental, and Mediterranean. 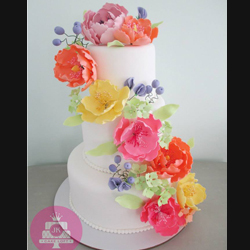 There is also no cause for worry on where to source for other wedding needs. Kasalang Tarlaqueño boasts of almost 50 different wedding suppliers, showcasing the diversity of the province's wedding supplies and services. "Kasalang Tarlaqueño is our way of promoting to all to-be weds that Tarlac can be your worry-free, hassle-free destination wedding of choice," shared Mr. Jun Baron of Tarlac Convention & Visitors Bureau (TCVB), the event's organizer. 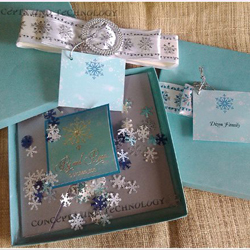 Earth & Sky by The Manila Catering Services. To top it all, TCVB also launched during the event the different tour packages that offer a variety of activities for honeymooners. Couples can opt to have a spiritual journey to the Monastery of the True Cross in San Jose, Tarlac or go on a nature's trek to Mt. Pinatubo via Capas, Tarlac route. So whether you are from Tarlac or from another town (or even from another country), it is not difficult to imagine getting married in Tarlac. As Central Luzon Tourism Council chairperson Mrs. Lydia Co said, "Tarlac has many things to offer. And we commit to nurturing our local wedding industry and tourism so couples need not look somewhere else for their wedding needs." 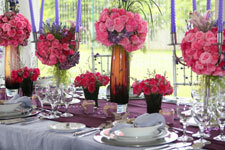 Please visit www.kasal.com for the Kasalang Tarlaqueño exhibitors' complete contact details. Kasalang Tarlaqueño, the 4th leg of Kasalang Filipino nationwide wedding fair roadshow, is organized by the Tarlac Convention & Visitors Bureau and Department of Tourism Region III, in partnership with The Manila Catering Services, The Aquino Center, Microtel Inn & Suites (Luisita), and Manila North Tollways Corporation. Kasalang Filipino 2007 is co-presented by Kasal.com and ABS-CBN; and is made possible by Philippine Airlines, Fuji-YKL, Chinabank, Standard Appliances, Colgate-Palmolive, Ever Bilena Cosmetics, Red Ribbon Bakeshop, Red Hat, MozCom PayEasy, QP Designs, Ariel Javelosa Photo & Video, Bitstop Network Services, and the following media partners: ABS-CBN Regional Network Group, Lifestyle Network, SkyCable, DWRR, My Only Radio, Metro Weddings magazine, Philippine News, Manila Bulletin's About Weddings, Business World, Business World High Life, The Manila Times, Real Living magazine, Flavors magazine, Entrepreneur magazine, The Beat magazine, Sun.Star, OFW Ngayon, Media G8way, loCalDirect, Philstar.com, Yehey.com, HerWord.com, PinoyExchange.com, DigitalFilipino.com, Tsinoy.com, Trabaho.com and ThePinoy.net.